Polhemus is the gold standard for digitizing products on the market. Our digitizers are easy-to-use with systems that allow you to move freely--around, under and behind objects--and have the capability to digitize both big and small items. You can digitize everything from engineering prototypes to artwork to EEG localization. The pinpoint accurate stylus is tracked by using Polhemus proprietary technology, utilizing AC Electromagnetics. We offer high-end, full 6DOF digitizers that won't break your budget. We deliver unmatched accuracy with system options that are easy to set up and ultra-portable. That's why we're widely recognized around the world as the "go-to" for digitizing products. We made digitizing even easier--with the click of a button. The hand/foot switch option allows the user to quickly and smoothly capture data points in 3D, while using the stylus. It can be used by hand or foot to accurately capture 6DOF points while eliminating unwanted movement of the stylus tip. Ideal for applications that require extreme precision, the hand/foot switch alleviates concern about any slight movement when the stylus is clicked. 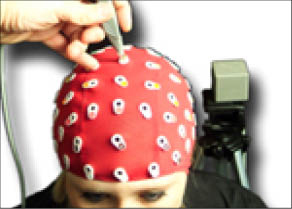 It can be used in a variety of applications, including EEG localization and much more. Capture data in hard to reach places without the use of any optical markers or a mechanical arm. With a standard range of 5 feet radius digitize items as large as a kayak, furniture, or a kitchen counter top.